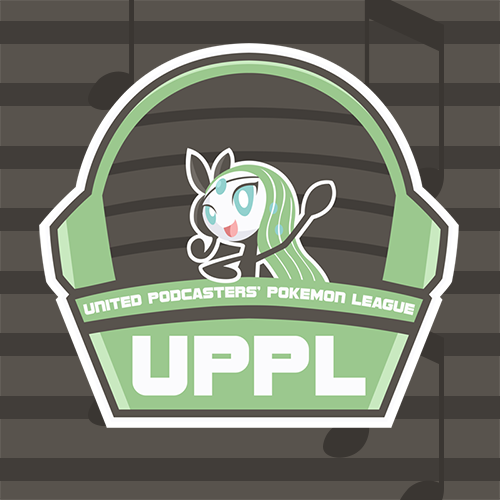 It is time for an UPPL Update as we go into Week 2! This past Saturday, your Nimbasa City Emolgas went into battle against the Vanish City Vaporeons. Somebody was going to vanish in this battle. All I wanted was to not drown in the competition. So how about we look back at the last week that led up to this battle against Celes the Lost and her Vanish City Vaporeons. The biggest thing that we notice about the Vanish City Vaporeons team was how rain center it was. Celes made sure to pick Pelipper as one of her big picks. From there she got things that would want to be in the rain. 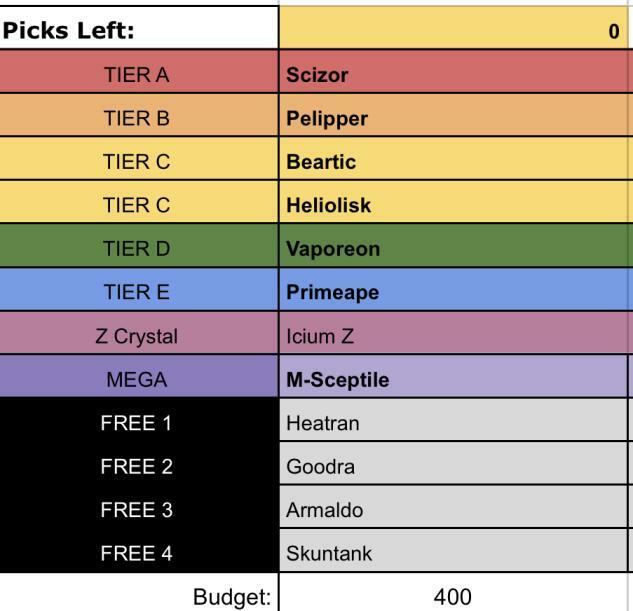 Some of these picks included Beartic who can abuse Swift Swim in the rain. Another pick was Scizor who wouldn’t mind taking a Fire hit if the rain was out. Sceptile was another Pokemon who wouldn’t mind the rain. Especially when the rain was up where it resist Fire attacks even more. A possible switch-in if a Fire attack was coming. Other things that we had to worry about when it came to Cele’s team was her Heatran and Goodra. Both of these Pokemon were threatening in their own rights. Heatran can be used as a defensive wall if it came in on a Fire attacks. It also have a powerful attack with Magma Storm which can be used to trap foes and damage them each turn. Goodra is just a really good bulky Pokemon that can take hits and hit back. If you are not careful then you can spend turns against one without doing any real damage to it. Goodra also has the Hydration ability which makes it ineffective to give it a status condition in the rain. The last two things that we were worried about was Armaldo and Heliolisk. These two Pokemon were also able to abuse the rain. Armaldo has access to the Swift Swim ability which makes it faster in the rain. Plenty of strong Rock attacks that can easily put a dent in my Pokemon. Meanwhile, Heliolisk has Dry Skin which means it gets to heal in the rain. It also has a high Speed stat that can outrun most of my Pokemon. Add in Heliolisk’s Special Attack power and it can punch holes if given the chance. With that said, we needed to plan our team. One of the things that I was certain on bringing was Volcanion. This guy could easily take a hit from Pelipper. It can also be used to wall plenty of things without any problem. It may not like going against Heliolisk, Armaldo or Goodra. After all, two of those things hit it for super effective damage while out speeding it. We decided to exchange our Alolan Muk for Florges. We figured that for this battle we wanted a little bit more Special Defense on our side. If we had to worry about threats like Heliolisk, Goodra, Ceptile and Pelipper then we needed something that can take a hit on the special side. What is even better is that Florges can use Defog to get rid of Stealth Rock. There is even an option to stall with Toxic and Synthesis. If we need to do a big hit then a STAB Moonblast is always there. There was some changes done for Mega Altaria this week as well. Last week we went with a Special Build. This time we decided to go for a Physical Sweeper set. That means we were going for Fairy Return. What made this set even more appealing was the fact that if we can get two Dragon Dance then there was a chance to knockout all of the Pokemon on Celes’s team. The rest of the team was pretty much carry over from the previous week. Gliscor was there to set up Stealth Rocks and take hits. Zeraora to go attack fast. Kartana was there to hit hard and not care. The battle started off rough to say the least. I led with Gliscor because I wanted to get Stealth Rock up. I figured that the chip damage would be useful in this battle. Celes decided to start with Heliolisk. In my mind, I thought this was fine because she would be force to switch out thinking I would use Earthquake or maybe she had nothing on Heliolisk to take down Gliscor. It turns out that Celes had Heliolisk pack some ice. In this case it was Hidden Power Ice. This attack had a strong Special Attack behind it. Add in Gliscor’s double weakness to Ice and that meant that we got one Pokemon down. The bad luck doesn’t end there as hax soon comes into play. I went into Florges at this point so it can soak up any damage that Heliolisk wanted to dish out. I also figure that I could either Toxic Heliolisk or whatever that would come out. I did predict the switch but I didn’t predict the miss on Toxic. In this case it was going to hit a Goodra. Too bad it didn’t. What did hit was Goodra’s Sludge Wave which hit my Florges of weakness. This took up half of Florges’s HP and it didn’t help that Florges got poison from the attack. I thought we would take that better because it was a special attack. Either way, it was time to swap into Volcanion. The hax didn’t stop there. Celes wanted to swap out as well into some immunity. That was why Heatran come out next. I guess she was thinking I would attack with Flamethrower. Instead I wanted to attack with Steam Eruption. I figure that there was a chance that Heatran would come out and I didn’t want to give Heatran even more fire power. That is why I decided to attack with Steam Eruption. Even if Celes decided to tank the hit with something else like Pelipper or Scizor then I could do some big damage and maybe get a burn. The problem was that the best time to hit a Heatran on the switch was the worst time to miss Steam Eruption. That would have been key as we would have gotten heavy damage on Heatran as it swap in. That left Volcanion open to an Earth Power and take some serious damage. We needed two Steam Eruption to knockout Heatran. Luckily, Volcanion was faster then Heatran. The problem was that now one of our walls was heavily damage after taking a Sludge Wave and Earth Power. This is where the tide of the battle begin to go in my favor. It all started with a Heliolisk that wanted to use Volt Switch on my weaken Volcanion. Now, I knew that Volcanion couldn’t take an Electric attack nor would it be faster then a Heliolisk. What I did know was that Zeraora could take a Volt Switch thanks to Volt Absorb. Even if Heliolisk didn’t use an Electric attack then Zeraora could at least take a hit. Zeraora switched in on a Volt Switch and took no damage. This force Celes to go into a hard switch into Goodra. The switching fun doesn’t end there as I took advantage of Volt Switch to switch out as well. This time into my Florges who seem like a good idea at the time. 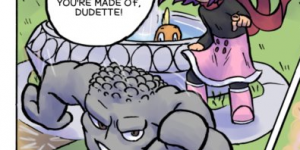 The problem was that I knew Goodra was packing Sludge Wave. I surely didn’t want to lose my Florges to that. It was why I decided to take a risk by switching into Kartana to take the Sludge Wave. It wouldn’t take damage and it meant that I could do some damage back. At this point I was thinking about why was Sludge Wave was doing so much damage. This Goodra must be equip with some sort of item to boost damage. So I figured it was equipped with Choice Specs or Choice Scarf. If it was one of those items then Goodra would need to swap out to somebody else. If I was wrong then Kartana wasn’t going to appreciate my idea to stay in. Either way, I was going to hit something with a All-Out Pummeling. Turns out that Goodra was Scarfed and that Heliolisk didn’t like taking a Z-Powered Fighting attack. That makes the second knockout. I guess Celes thought I would boost up or attack with a Smart Strike. Heliolisk would resist the Steel type attack while most likely out speed Kartana. That was some pretty good thinking. Next was Goodra and I wasn’t going to stay for that. Even if we got a boost to our attack power. I figured that Celes brought in Goodra for a good reason. It can either tank any attack we fired or hit us hard with something. Maybe both. Either way, I wasn’t going to stay in. I was correct because Goodra was packing some heat with Fire Blast. It took out my last big wall which was Florges. It was now time to go all out and I was going to do that with Mega Altaria. Get myself a Dragon Dance as I now knew Goodra was locked into Fire Blast. This force Celes to go into Scizor and I knew this was my cue to return Mega Altaria. I may have wasted a Dragon Dance but I wasn’t going to have my Mega Altaria go down when there was more work to be done. Apparently Celes had the same idea as I did as she decided to Sword Dance as I go into Zeraora. I knew I had two choices here. Go into Volcanion and know that I can’t out speed in an attempt to use Flamethrower. Or just keep punching with Zeraora and put some pressure on it. I decided to put pressure with Plasma Fist. We kept punching each other with Scizor and Zeraora. They were not big hits but what helped me was Celes’s decision to get another Swords Dance as I decided to keep punching. That brought down Scizor. After that the match was mostly smooth sailing. Beartic came in and used Aqua Jet to take down Zeraora. I should have swap into Volcanion but I forgot about Aqua Jet. Kartana came in and made quick work of Beartic. This brought out Goodra who used Fire Blast in an attempt to knockout Kartana. I decided to swap out into Mega Altaria to preserve my Kartana for a late game attacker. That was a good idea because now I could use Fairy Return to take out Goodra and Pelipper. This match was a pretty intense one as I knew Celes wasn’t going to be a pushover. She has much more experience then me. I just knew that I had to keep countering her and apply pressure. It didn’t help that I lost my walls early in the game. I regret having Gliscor and Florges taken out so early in the game. Though my attackers came in and save the day. 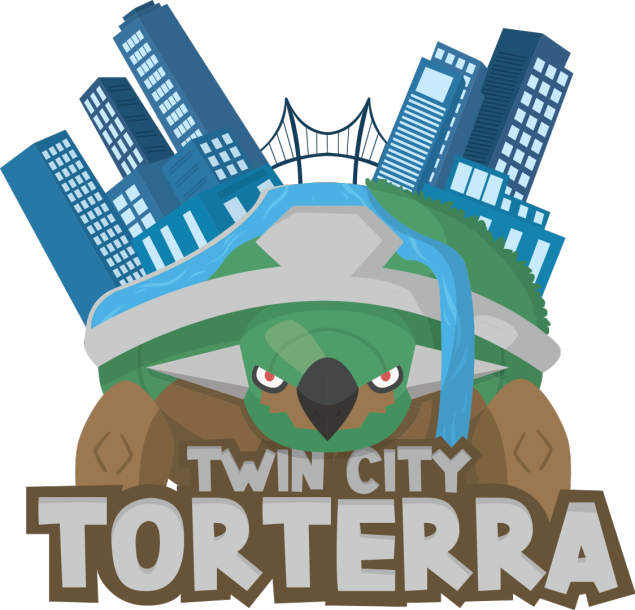 And the hits don’t stop coming as this week will feature a battle with MeserEngine and his Twin City Torterra. MeserEngine makes up one-third of the trio at Blast Burn Radio. He is maybe the toughest of the three when it comes to battle. A true warrior who has master the art of attack and defense. He can can throw up a shield to defend and is infamous on the show for his stalling tactics. MeserEngine isn’t afraid to throw out Toxic and wait for turns to pass so he can take a knockout. Meanwhile, he knows when to attack to do some heavy damage. And you bet MeserEngine’s draft team reflects this. He has scary threats like the infamous Landorus-T with Mega Tyrantar. Meanwhile, MeserEngine has hefty walls in the form of Ferrothorn and Reuniclus. These are not something I want to face without a plan. Silvally can be any type MeserEngine wants it to be which can be used to do some serious damage if I am not careful. Primarina and Venomoth are heavy special attackers who can punch holes in any team. 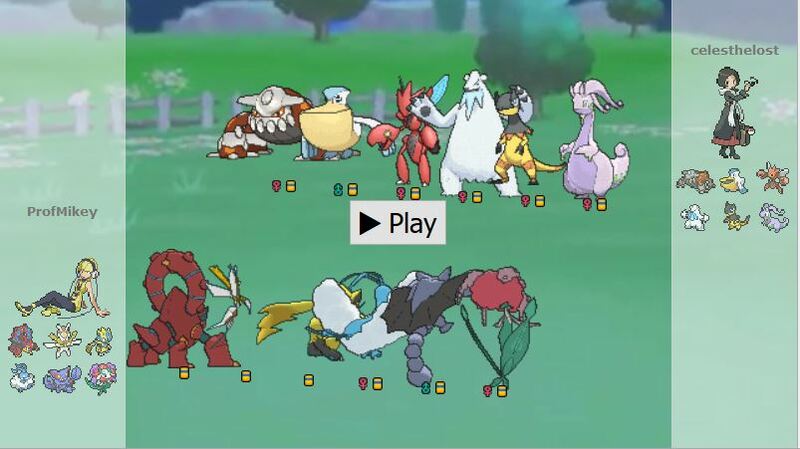 So far MeserEngine is in the lead with only losing at most one Pokemon in his first two matches. I am planning to take at least three knockouts if I am going to lose to him. Though, I don’t plan to go into this battle without swinging hard for the win. The plan is to die a hero or live long enough to become the villain. If I can do that then this battle is going to be a good one. ← Palkia to GO into Raids!